This year, we aren’t using Great Auntie Trina’s beautiful Halloween countdown calendar (the kids move a little black cat from felt pocket to felt pocket each day of the month) only to tick off time before–CANDY. On or before the 31st (we hope!) will be the arrival of something even sweeter—another niece, another cousin—another baby for our ever-growing extended family. At her shower, we gave my sister-in-law a little bookshelf filled with our favorite Picture Book House baby books. Hurry! Hurry! 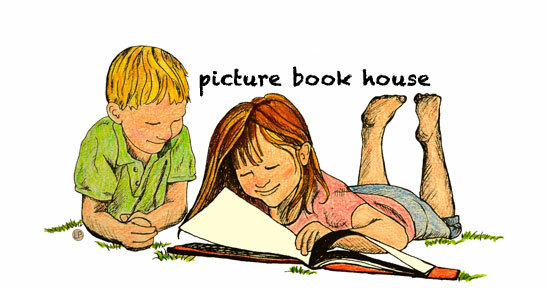 by Eve Bunting (Houghton Mifflin Harcourt, 2007) was one of them. There are only thirty-nine words in the entire text. The first two: “Hurry! 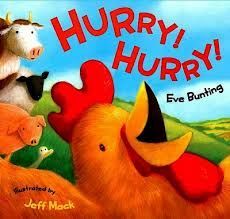 Hurry!” Mama Hen hails to the barnyard, beak tipped back, wings spread wide. She doesn’t tell us why to hurry, but we can guess…and so can goat, duck and her ducklings, cow and her calves, sheep with her lambs, and every other animal in this close-knit barnyard family. “Coming! Coming!” reads the spread with goat, who is racing toward the barn. “Ready? Ready?” Mama Duck asks. “Yes! Yes!” reply her ducklings, who take flight, presumably for the first time, on their way to the barn. This pattern continues “Quick! Quick! Can’t Can’t! Try! Try! Go! Go! Good! Good!, until everyone reaches the barn, and hen, and her…egg. There are a few final spreads, with words and images that powerfully capture the miracle of birth, and gave me goose bumps while I read them aloud with Michelley-Big-Belly (as my daughter has affectionately nick-named her). If you, or someone you love, are expecting a baby, check out this book. Even if you’re not, but enjoy a heartfelt story, or pictures of cute farm animals, or, like me, go all goo-goo-ga-ga for any book CHICKEN—Hurry! Hurry!’s well worth the read. We will read it, again and again, while we wait for our new baby niece/cousin to arrive. Come when you are ready, little one, but if you don’t mind, “HURRY! HURRY!” We can hardly wait.